Tan Queen: Karora Express Bronzing Mousse Review! Last weekend I decided to go out last minute and was milk bottle white. 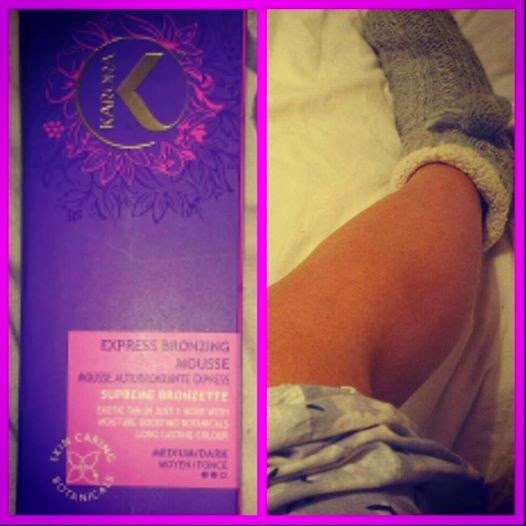 I hadn’t got time to wait for tan to develop so decided to try the Karora Express bronzing mousse 1hr tan. The luxury tan glides on so easily making it almost impossible to miss a spot or have any streaks. It dries in seconds and develops in just 1 hour allowing you to decide your personalised shade of bronze. The 1 hour express turnaround will leave skin sun kissed with a golden hue post-rinse. Take the 2 hours option for a glamorous glow that is darker but still subtle or for deeper intense colour take the 3 hour option, for a tan that’s so natural it’s easily credited to a week in the Tropics! I went with option 3 and achieved a deep bronze colour that I loved. This express bronzing mousse delivers custom colour to suit your skin tone. A true luxe investment – KARORA bronzing mousse has skincare status and contains an injection of botanical extracts to deliver complexion perfection. Bergamot, Green Tea, Aloe and Acai Berry instantly renew the skin while a sumptuous blend of rosemary leaf, argan, lemon and grapefruit essential oils leave skin conditioned and delicately scented. Previous Post Celebrity Wedding Dress Inspiration! Next Post WIN Top Image Tan!